I am going to pic a name tomorrow for my 1 year contest. I can see that I am so popular, so I thought I better give the people one more chance to enter!! But, if it is just you few on the list then you might each get a gift specially designed just for you. That would be more fun anyway. So stay tuned for tomorrow when I have Emily pick a name or we will see what happens!! 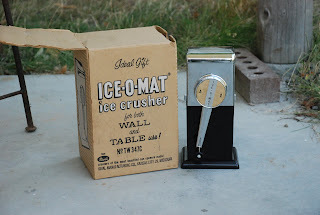 There could be an ICE-O-MATIC in someone's future! Thank GOODNESS you extended it!! How did I miss that? Congratulations! And, that's some hair ya have there, missy! I loved Little Voice, too. I'm a big Jane Horrocks fan. Everything I've seen her I have loved. I'd like the vintage ice crusher. JUST KIDDING! No really I am just kidding. I am getting slap happy here waiting for my PMC paste to dry.